“The clothes make the man” is a phrase that probably could have been penned during the Victorian period. Victorian clothes were very much a symbol of the status and standard of living of the person. Children in the Victorian era usually wore huge bulky clothes to reveal the status of their parents and family. The concept of sewing machines emerged only towards the end of the Victorian era. Until then there was no way at all of making cheap clothes. Most wealthy and middle-class children wore exquisite dresses designed by a dressmaker, unlike the poor children who wore tatty clothes and rags which were often discarded by the rich people and were handed down to the poor class. The upper class wore rich tailor-made suits or frocks which were worn by them until they were beginning to show little traces of dirt. Then they were discarded as the fine outer garments could not be washed without spoiling them. Other clothes when showed the signs of wear were discarded and then were passed on to the poor class. The discarded clothes were usually given to the servants, who wore them until they reached the next stage of decay and then the poor class would sell them to the street urchin who would wear clothes which were of no value. Good second-hand clothes commanded quite high prices. The dresses and clothes of baby boys and girls were quite similar for most of the Victorian period. The royal families were fashion setters such as sailor suits and tartan. 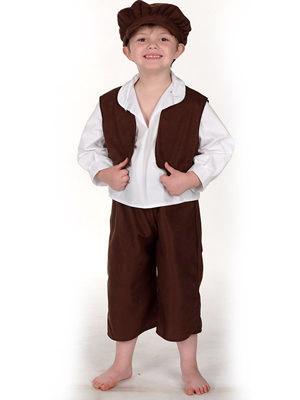 Children’s clothing was much similar to the adult dresses. There was a gradual decline in the practice of dressing children in adult styles during the second half of the 19th century. The Victorian era boys would have white linen shirts with huge bows about the necks and velvet breeches that fitted at the knees. The huge sailor collars for both boy’s and girl’s clothing came into fashion during the Victorian period. Cotton or silk stockings were worn which would cover the lower legs. The shoes of the children were made of fine leathers with ornate buckles. The well-dressed Victorian boys would also wear broad-brimmed straw hats with decorations of ribbons. Long curls were quite popular for the boys during the Victorian times. The common style was the pageboy cuts just above the shoulder. Little girls who lived during the Victorian times wore starched and pressed pinafores and their hair would be curled and styled to perfection without any fault. They would wear cotton or silk stockings to cover their legs and their shoes would be made of soft leathers or beautiful fabrics that matched their dresses. The peculiar style of the dresses was dropped waists and huge bows that tied in the back. These were commonly made with huge sailor-style collars with bows at the center. For some of the more formal dresses, miniature bustles were made in similar style to the women’s fashion of the day.